Haq's Musings: Can Pakistan Avoid Recurring BoP Crises Requiring IMF Bailouts? Can Pakistan Avoid Recurring BoP Crises Requiring IMF Bailouts? Every country needs US dollars to import products because the US dollar is the international trade and reserve currency. Only the United States can print dollars; all others must acquire them through exports and capital inflows like investments, remittances and loans. Pakistan has had serious problems in acquiring sufficient amount of dollars for its needs through trade and investments over the last several decades. It has been forced to seek IMF bailouts repeatedly. China and other East Asian nations have built up large dollar reserves by running massive trade surpluses mainly through exporting lots of products and services to the rest of the world. Others, such as India, have built up significant US dollar reserves in spite of running large trade deficits. India relies mainly on foreign investments, remittances from non-resident Indians and foreign debt for its dollar reserves. India is consistently ranked among the top recipients of foreign direct and portfolio investments as percentage of its GDP. Like India, Pakistan also runs large trade deficits. It also depends on foreign investments, remittances from overseas Pakistanis and foreign debt for its dollar reserves. So why does Pakistan have serious recurring balance of payments crises? Unlike India, Pakistan ranks very low among recipients of foreign direct and portfolio investments as percentage of its GDP. . Part of it is the perception of insecurity since 911. The real security situation has dramatically improved in the last few years but the perception continues to lag. Pakistan's exports have also lagged behind India's as percentage of gross domestic product (GDP). In fact, Pakistan's exports have halved from about 16% of GDP in 2003 to 8% of GDP in 2017. India's exports have increased from 15% to 19% of GDP in the same period, according to the World Bank. Pakistan has a fairly diverse industrial sector which caters to its domestic market. People running these businesses and industries have little or no knowledge of the customer needs and regulatory requirements of foreign markets where their products or services could be sold to boost Pakistan's exports and dollar earnings. Pakistan's economic attaches posted at the nation's embassies need to focus on all export opportunities in international markets and help educate Pakistani businesses on the best way to take advantage of them. This needs to be a concerted effort involving various government ministries and departments working closely with industry groups. Pakistan's new government led by the Pakistan Tehreek e Insaf Chief Imran Khan needs to urgently crack down on illicit outflow of dollars. One of the ways large amounts of money moves across international borders is through trade misinvoicing. Global Financial Integrity (GFI) defines trade misinvoicing as "fraudulently manipulating the price, quantity, or quality of a good or service on an invoice submitted to customs" to quickly move substantial sums of money across international borders. It is not just greedy politicians, unscrupulous businessmen and corrupt officials in developing countries who rely on fraudulent manipulation of trade invoices; all kinds of drug traders, terrorists and criminals also use what is called TBML (trade-based money laundering). Pakistan needs to find a way to build up and manage significant dollar reserves to avoid recurring IMF bailouts. The best way to do it is to focus on increasing the country's exports that have remained essentially flat in per capita terms. Pakistan's economic attaches posted at the nation's embassies need to focus on all export opportunities in international markets and help educate Pakistani businesses on the best way to take advantage of them. This needs to be concerted effort involving various government ministries and departments working closely with industry groups. At the same time, the new government needs to crack down on illicit outflow of dollars from the country. Can Indian Economy Survive Without Western Capital Inflows? Chinese Yuan to Replace US $ as Reserve Currency? One of the reasons why India's exports/GDP looks very good is as you have yourself insinuated in the past, that a lot of IT services export is (mis)classified as exports. With CPEC benefits likely to kick in by H2 next CY, Pakistan's exports should grow exponentially and hopefully some of the financing/forex related concerns should abate. 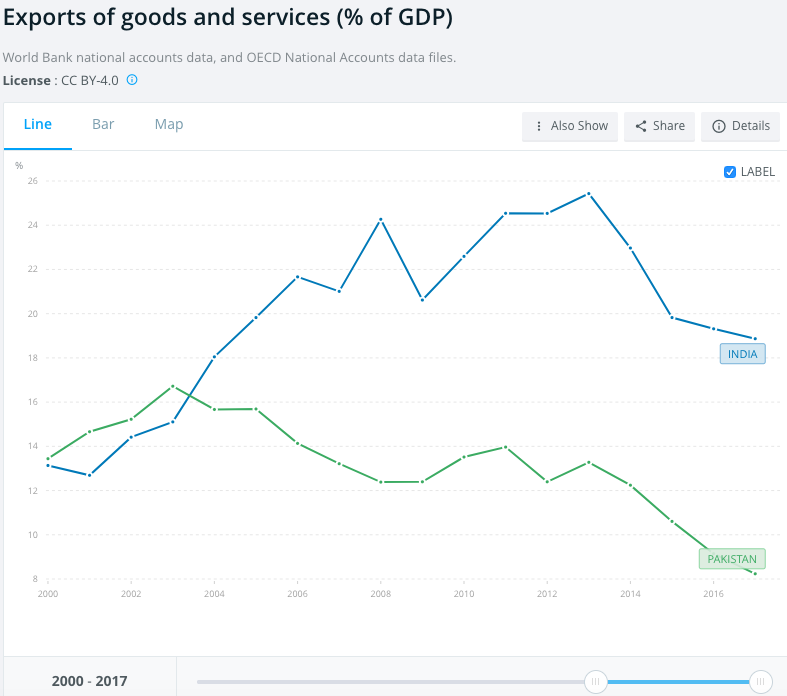 Majumdar: "One of the reasons why India's exports/GDP looks very good is as you have yourself insinuated in the past, that a lot of IT services export is (mis)classified as exports. " First, India still runs huge trade deficits year after year. It has to rely on foreign investments and borrowings mainly from the West to avoid going to the IMF. Second, it is a fact supported by US trade data. US import figures from India differ sharply from India's export figures to US. Depending upon how one adjusts for important definitional differences, the gap between the U.S. and Indian estimates either entirely disappears or is substantially reduced." Pakistani officials have criticised what they say are attempts by the US to use the country’s impending economic crisis to drive a wedge between Islamabad and Beijing. Officials in Islamabad have accused Washington of trying to strong-arm Pakistan into scaling back billions of dollars’ worth of Chinese investment in their country’s infrastructure as part of a potential bailout by the IMF. The Financial Times revealed this week that Pakistani officials had drawn up plans to ask the IMF for a $12bn bailout soon after Imran Khan comes to power as the country’s new prime minister. Pakistan is suffering an acute shortage of foreign reserves after years of high imports and low exports have taken their toll. But even before Pakistan even makes a request, there are signs of resistance from the US, which is the IMF’s biggest shareholder. Mike Pompeo, US secretary of state, on Monday warned the IMF not to grant a bailout to Pakistan that would compensate Chinese investors in Pakistani projects. Beijing is planning to invest about $60bn in its southern neighbour as part of a wider plan by President Xi Jinping to establish a new silk road of global trading routes. It has so far refused to publish any details of the terms of those loans however. While Islamabad says the project will revolutionise Pakistan’s infrastructure, there are signs it is creating short-term economic problems, with loan repayments further depleting its foreign currency reserves. Belt and Road, or debt trap? Earlier this month, the Wall Street Journal revealed Pakistan had fallen behind on some of its payments, including plans to build new power plants. But any demands by the US for China to publish the terms of its CPEC loans, as well as to scale back its investments and even write some down, could set up a bruising clash between Beijing and Washington. China is the second-biggest shareholder in the IMF, but does not have a veto on its board-level decisions. For now, China is continuing to keep Pakistan afloat with short-term lending. According to local reports, Beijing has agreed to lend Islamabad a further $2bn since last week’s election, adding to the $5bn Pakistan borrowed from Chinese commercial banks in the previous financial year. Buy the Gold and build its reserves - ditch the dollar and trade in currencies of relevant countries (China, Iran, Russia, Turkey). Moh: "Buy the Gold and build its reserves - ditch the dollar and trade in currencies of relevant countries (China, Iran, Russia, Turkey)." It has long been recognized that the US dominance in global affairs is at least partly attributable to the US dollar as the world's biggest reserve and trading currency. Nearly two-thirds of the world's central-bank reserves are denominated in US dollars, according to data from the International Monetary Fund. The euro accounts for about a quarter -- up from 18% when it was introduced in 1999, but less than its predecessor currencies' share in 1995. Because the U.S. is such a huge trading partner for so many countries, the reserve buildup isn't easily unwound. According to the Wall Street Journal, the dollar is also deeply entrenched in world trade. Businesses lower their transaction costs by dealing in a common currency. More than 80% of exports from Indonesia, Thailand and Pakistan are invoiced in dollars, for instance, according to the latest figures available in research by the European Central Bank, although less than a quarter of their exports go to the U.S. Taking a page from the history of US rise in the last century, the Chinese efforts on currency appear to be only the first part of its larger push to assert its status as a new superpower of the twenty-first century. In a piece interestingly titled "It’s China’s World. We’re Just Living in It" in the latest issue of Newsweek, the authors argue that the Chinese are looking to reshape the world with China at its center. The larger plan includes the creation of a new framework with a new set of international institutions through which the Chinese can exercise their power. While many nations want to change at least part of their reserve holdings from US dollars to euros or other alternatives, they know if they sell a significant share of their dollar reserves, it would weaken the dollar's value. That would potentially hurt their own trade competitiveness, and push down the value of their remaining dollar reserves. If they keep the dollars, a buildup of unwanted assets would only mount. The US often struggles to convert its economic power into political outcomes, though President Trump has ramped up efforts to do precisely that. In the fight against terrorism, the US Treasury has greatly expanded its efforts to cut off financing and through the experience and the Great Financial Crisis, access to the US dollar market, including for funding, is not simply a utility but is a privilege that the US could deny its adversaries. There are other ways in which the US can use its financial acumen to impose its will. Here is a drama that is unfolding, though it has not percolated into the public's consciousness yet. It begins in Pakistan, which has been party to at least 13 IMF programs since 1980. Although it has not formally asked for another one, macro considerations suggest it is likely. Many expect Pakistan's likely new Prime Minister, Imran Khan, to seek one shortly after assuming office. His party is about 22 seats shy of a parliamentary majority, after running a campaign against the two main ruling families. The US is threatening to veto it, which would make it hard for Pakistan to service its debt. Its debt is primarily owed to the IMF, World Bank, and China. Pakistan is caught between a rock and a hard place. Given the number of times it availed itself to IMF assistance, it will be reluctant to stiff the multilateral lenders. It also wants to avoid having a debt problem with China, which has shown itself to be a harsh taskmaster. Loans from China are often not on concessionary terms and involve collateral. Recently, for example, Sri Lanka has to transfer ownership of Hambantota port to China (for 99 years, shades of Hong Kong). Saudi has confirmed 4.5 Billion dollars. Raheel sb be blessed. We should be able tide over. Sir, you wrote this in one of your previous blogs. "Many other economies have been growing faster and producing higher investor returns than India. So the returns do not justify the increased capital flows. Such flows are driven much more by the changing geopolitics of South Asia region and the world since the end of the Cold War in early 1990s. Without these inflows, Indian economy would collapse and India would be at IMF's door seeking last resort loans." Perhaps you completely missed the boat on that or perhaps the write up was driven by an inherent negative view of India. From my perspective India has been chipping away at economic and structural road blocks and unlike China's model, it will take longer. What is alarming in Pakistan's case is that very little is happening on the structural issues. Pakistan plans to borrow more than $4bn from the Saudi-backed Islamic Development Bank as part of its attempts to restore dangerously low stocks of foreign currency. Two officials have told the Financial Times that the Jeddah-based bank has agreed to make a formal offer to lend Islamabad the money when Imran Khan takes over as prime minister. They added that they expect Asad Umar, Mr Khan’s proposed finance minister, to accept. The person added that the loan would not cover Pakistan’s expected financing gap of at least $25bn during this financial year but was “an important contribution”. Mr Khan, Pakistan’s former cricket captain, is expected to take over as prime minister in the coming days after his Pakistan Tehreek-e-Insaf party won the most seats in last month’s election — though it fell short of an outright majority. One of his first jobs will be to repair the country’s balance of payments problem, with high imports and stagnant exports having bled the country of much of its foreign exchange reserves. Officials have already drawn up plans to borrow up to $12bn from the International Monetary Fund — though such a bailout is likely to come with strings attached, such as a demand to see the details behind billions of dollars’ worth of Chinese loans. Mr Umar is therefore exploring what other options remain open to him, of which the IDB loan is one. Officials said the loan would be used mainly to pay for oil imports, with higher crude prices having contributed to Pakistan’s problems. One official at the Pakistani central bank who has been involved in negotiations with the IDB said the loan had the backing of the Saudi government, “which wants to play a part in rescuing Pakistan from its present crisis”. Islamabad and Riyadh have moved closer in recent months after Pakistan agreed to send an undeclared number of troops to “train and advise” security forces there. The Pakistan government insists that the soldiers will not be used to fight in Yemen however, something the Saudis had previously requested. Despite the promise of money from the IDB, economists warn that Mr Khan’s new government will still have to enact potentially unpopular spending cuts and tax rises to help repair the government’s balance sheet. The trade deficit -- gap between exports and imports -- was $18 billion in July, fanned by a higher oil import bill, data released by India’s commerce ministry showed on Tuesday. That compares with the $15.7 billion median estimate in a Bloomberg survey of 24 economists and $16.6 billion in June. While a weaker rupee is positive for exports, it poses an inflation risk for a nation that imports more than 80 percent of its crude-oil needs and adds to the stress on the current-account balance. The rupee dropped to as low as 70.08 per dollar on Tuesday, keeping intact its position as Asia’s worst-performing currency this year. Every rupee change in the exchange rate against the U.S. dollar impacts India’s crude-oil import bill by 108.8 billion rupees ($1.58 billion), according to the oil ministry. Inbound shipments of oil in July were at $12.4 billion, up 57.4 percent from a year ago, while gold imports surged 41 percent to $2.96 billion and electronics goods by 26 percent to $5.12 billion. Overall imports rose 29 percent to $43.8 billion, while exports grew at 14 percent to $25.8 billion. The last time trade deficit was wider was in May 2013 at $19.1 billion, according to data compiled by Bloomberg. “Broader emerging-market currency movement, dollar strength, and the trend in crude-oil prices will drive the outlook for the rupee in the immediate term, which will have an impact on the landed cost of imports,” said Aditi Nayar, principal economist at ICRA Ltd. in Gurugram, near New Delhi. That will also have a bearing on various commodity prices and transmit into wholesale price inflation, she said. Gains in wholesale prices eased for the first time in five months, Commerce Ministry data showed on Tuesday. Government data on Monday showed retail inflation quickened 4.17 percent in July from a year earlier, slower than the 4.5 percent median estimate in a Bloomberg survey of economists. The monetary policy committee led by Governor Urjit Patel has increased interest rates twice since June to curb price pressures, while the central bank used foreign reserves to check currency volatility. The rupee reversed losses to close 0.1 percent higher at 69.8963 on Tuesday in Mumbai, with traders saying state-run banks sold dollars, probably on behalf of the RBI. The current level of reserves at about $402 billion will provide import cover of less than a year. The nation’s current-account gap has come under pressure and is expected to widen to 2.4 percent of gross domestic product in the financial year to March 2019, from 1.9 percent in the October-December period. For India, the slight depreciation of the rupee should prove to be beneficial to its export drive. There is no panic in the markets , Sensex has surged more than 200 points today. India's central bank has accumulated over $ 400 billion in currency reserves and can easily navigate through this situation. Dawud: "Is this news? For India, the slight depreciation of the rupee should prove to be beneficial to its export drive." Yes. India rupee hitting record lows is NEWS, just as Turkish Lire hitting new lows is NEWS. India's trade deficit being worst in 5 years in also news; it exposes India's dependence on western capital to keep its economy afloat. India runs massive current account deficits. Its imports far outstrip exports year after year. According to the Reserve Bank (RBI) data, in the April-December 2014 period of last fiscal, India's current account deficit stood at $31.1 billion or 2.3% of GDP. In spite such large recurring deficits, India has built up over $300 billion in foreign exchange reserves. How does it do it? The simple answer is: Foreign money inflows in the form of debt and investments mainly from the West keep the Indian economy afloat. "Seen through the narrow lens of the West’s security and economic interests, the great internal contradictions and tumult within these two large nation-states (India and Pakistan) disappear. In the Western view, the credit-fueled consumerism among the Indian middle class appears a much bigger phenomenon than the extraordinary Maoist uprising in Central India". "Gross capital flows have increased nearly 22 times from $42.7 billion in 1991-92 to over $932.3 billion in 2010-11. As a share of GDP, this amounted to an increase from 15.5% in 1991-92 to 55.2% in 2010-11. Much of the increase in financial integration occurred between 2003-04 and 2007-08. Given the impressive economic performance indicated by close to 9% growth rate, higher domestic interest rates and a strong currency, India's risk perception was quite low during 2003 to 2007. Furthermore, this period was associated with favorable global conditions in the form of ample liquidity and low interest rates in the global markets—the so-called period of Great Moderation." Many other economies have been growing faster and producing higher investor returns than India. So the returns do not justify the increased capital flows. Such flows are driven much more by the changing geopolitics of South Asia region and the world since the end of the Cold War in early 1990s. Without these inflows, Indian economy would collapse and India would be at IMF's door seeking last resort loans. Lesson: Geopolitics drive economy. It's the reason for over a trillion dollars of western capital flow into India since the end of the Cold War. It also explains China's massive $46 billion investment commitment in Pakistan agreed during President Xi Jinping's state visit to Islamabad. To rein in Pakistan’s rising trade deficit, China is said to have offered Islamabad the option of commencing trading in Renminbi (Yuan) in which regard meeting has been held with the State Bank of Pakistan (SBP). According to sources privy of the development, the recommendation was put forth by the Chinese Ambassador to Pakistan Yao Jing in a meeting with ex-interim Minister for Commerce, Mian Misbah-ur-Rehman, reports Business Recorder. In the meeting, several issues of economic cooperation and bilateral between the two countries were brought forth. Also, China is mulling announcing unilateral trade concessions to Pakistan which will increase its exports to Beijing and hence decrease trade deficit. The China-Pakistan free trade agreement (CPFTA) part 1 favoured China since their exports to Pakistan were valued over $15 billion compared to Pakistan’s exports of a meagre $1.5 billion in FY18. And the last round of CPFTA talks held in Islamabad were unsuccessful as both countries were unable to reach an agreement on the second phase. Also, a high-level meeting presided under the chairman of ex-prime minister Shahid Khaqan Abbasi had taken the decision of not finalizing CPFTA part 2 till the industry was taken aboard. Furthermore, sources quoting the Chinese ambassador said Beijing was contemplating to invite new Prime Minister Imran Khan as a guest of honour for China Import Fair set to be held in November 2018. To ensure this visit more purposeful, the Chinese ambassador stated a team led by the Commerce Minister or the Secretary Commerce could visit China before the visit of new PM to find out areas of cooperation and firm up the aim of his visit. In reply to the interim commerce minister’s worry on granting concessions to India and Bangladesh, the ambassador said those had been proclaimed under the framework of Asia-Pacific Trade Agreement (Bangkok Agreement). The Chinese ambassador added China-Pakistan Economic Corridor (CPEC) was aimed more on energy and infrastructure linked projects, but Beijing recognized new areas of cooperation and support to Pakistan’s government via trade promotion, foreign direct investment (FDI) and social sector support. For this, a delegation of Chinese Customs and Quarantine department would come to Pakistan shortly to address concerns over market access and quarantine issue which were impeding trade between both countries. While talking about FDI, Mr Jing stated Beijing would begin measures to enhance joint venture and investment in special economic zones (SEZs). He advised Shanghai Import Fair would provide a good chance for Pakistan to exhibit its investment potential. On the topic of social sector cooperation, Mr Jing said regional governments of Xinjiang province and Gilgit-Baltistan (GB) were working in tandem to enhance infrastructure facilities at border posts to resolve customs and quarantine related problems. Dr Li Jing Feng, director, Regional Studies and Strategic Research Centre, Sichuan Academy of Social Sciences, Beijing, China, has said that China asked its state-owned companies to invest in Pakistan and transfer technology to Pakistan under CPEC. Dr Li was answering questions at a roundtable on “BCIM-EC & CPEC within China’s Belt-and-Road-Initiatives” organised by Institute of Regional Studies here Monday. Dr Rukhsana Qamber, president of IRS, conducted the proceedings. Dr Li said that we also train local workers here to start from ground zero in the journey to value added products. Answering another question, Gawadar is more important than Chabahar port as it is a deep sea port and bigger ships cannot dock in the Iranian port. He observed that Chinese being killed in Pakistan are of extreme concern for China.Earlier, in his talk, Dr Li focused his discussion on BCIM economic corridor and compared it with CPEC. He said that due to Indian reservations, the Bangladesh China India Myanmar Economic Corridor (BCIM-EC) would not be successful although both Bangladesh and Myanmar were in favour of it. On the other hand, CPEC would be successful for a number of reasons, the main one being the strong understanding and mutual trust that exists between Pakistan and China, he said adding that Gawadar is developing and would ultimately become a developed city. He was also aware of the negative feelings on CPEC that have been aired in various fora. Mr Annice Mahmood formerly from Pakistan Institute of Development Economics said that like China, Pakistan should export its surplus produce to rectify its balance of payment deficit. He said that remittances to Pakistan are from unskilled workers but still we are getting something. He said Russia tried to help us stand on our feet but we did not respond. India responded and got the dividend. He said instead of getting profit and paying back but not much was done to create self-reliance and promote self- sustained growth within the country. Developing China-Pakistan relations has always been a priority of China's neighborhood diplomacy. China is looking forward to strengthening cooperation with the new Pakistani government, bringing more dividends of the CPEC to the grassroots and the general public in Pakistan, making it a model project for the benefits of both peoples. China will actively promote investment in Pakistan. The Chinese government will firmly promote industrial cooperation, expand China's direct investment in Pakistan, and encourage Chinese enterprises to actively participate in the construction of special economic zones. Its focus of cooperation will be upgrading Pakistan's manufacturing capacity and expanding export-oriented industries. We will continue to organize delegations from the private sector in China to visit Pakistan and set up various platforms for business-to-business cooperation. We will also continue to promote the transfer of high-quality and advanced industrial technologies from China to Pakistan, establish more joint ventures, and strengthen the brand of "Made in Pakistan". China will also actively expand its imports from Pakistan. In November, China will hold the first China International Import Expo in Shanghai, where, as one of the "Chief Guest" countries, Pakistan has been invited to send a large delegation of exporters and set up exhibitions at both the national and export levels. It is hoped that Pakistan will make full use of this opportunity to promote its superior products to China. The Chinese side will also promote cooperation between the customs and quarantine authorities of both countries to facilitate the further opening-up of China's agricultural product market to Pakistan. China will, under the framework of free trade cooperation between the two countries, provide a larger market share for Pakistani goods, and strengthen cooperation and facilitate local trade between Gilgit-Baltistan and China's Xinjiang Uygur autonomous region. And China will take further visa facilitation measures to encourage more Pakistani businesspeople to visit China. Besides, China will focus more on helping Pakistani people improve their livelihoods. It will actively promote cooperation between the two countries' universities, establish more vocational and technical training centers in Pakistan, provide aid for building 50 schools in the tribal districts of Khyber Pakhtunkhwa province (that is, in the former Federally Administered Tribal Areas), expand the primary school in Gwadar "donated" by China. The purpose of this is to help Pakistan improve the quality of its human resources, especially of the youth. Besides, China will consider setting up an agricultural technology demonstration center in Pakistan to improve local agricultural technology, production efficiency and value-added agricultural industry. It also will strengthen scientific and technological cooperation with Pakistan, establish a China-Pakistan Joint Research Center on Earth Science, strengthen scientific research on disaster reduction and prevention, promote ecological and environmental protection, and help develop green and sustainable growth in Pakistan. Moreover, Beijing will encourage Chinese companies to fulfill their social responsibilities and play a more active role in sponsoring livelihood projects. We will also explore more pragmatic cooperation with Pakistan in such areas as poverty alleviation and healthcare. U.S. Secretary of State Mike Pompeo assured Pakistan last week Washington would not try to block any request for a bailout from the International Monetary Fund (IMF), Pakistani Information Minister Fawad Chaudhry said on Tuesday. The remarks, which Chaudhry said Pompeo made during his visit to Pakistan on Wednesday, come in stark contrast to Pompeo's warnings in July that the United States had serious reservations about the IMF giving money to Pakistan due to concerns Islamabad would use the cash to pay off Chinese loans. Those comments rattled Islamabad, which is facing a currency crisis and may have no option but to turn again to the IMF for a rescue if staunch allies China and Saudi Arabia do not offer more loans to prop up its foreign currency reserves. Chaudhry told Reuters that relations between United States and Pakistan were "broken" before Pompeo's trip to Islamabad but the visit had "set many things straight" and re-invigorated ties. "He assured Pakistan that...if Pakistan opted to go to IMF for any financial help, the USA will not oppose it," Chaudhry said in the capital, Islamabad. The U.S. embassy in Islamabad did not have any immediate comment. The new government of Prime Minister Imran Khan, who took office in August, is trying to avert a currency crisis caused by a shortage of dollars in an economy hit by a ballooning current account deficit and dwindling foreign currency reserves. Pakistani officials say they are discussing taking drastic measures to avert seeking a bailout from the IMF, which has come to Pakistan's rescue 14 times since 1980, including most recently in 2013. Pakistan's relations with the United States have soured in recent years over the war in Afghanistan and Islamabad's alleged support for Islamist militants. Ties dropped to a new low when President Donald Trump in January accused Pakistan of lies and deceit by playing a double game on fighting terrorism. Islamabad denies aiding insurgents in Afghanistan and lashed out against Trump's remarks, which were followed up by Washington suspending U.S. military aid. At the United States' urging, a group of Western countries in February convinced a global body to put Pakistan on a terrorism financing watch list, a move that triggered concerns the United States may also seek to block Islamabad in other forums. In July, Pompeo said there was "no rationale" for the IMF to bail out Pakistan. Pompeo's worries that Islamabad would use the IMF money to pay off Chinese loans echoes concerns by other U.S. officials that China is saddling many emerging market countries with too much debt. Beijing staunchly denies such claims. "There's no rationale for IMF tax dollars, and associated with that American dollars that are part of the IMF funding, for those to go to bail out Chinese bondholders or China itself," Pompeo said in July, referring to a possible Pakistan bailout. But during last week's visit Pompeo said he was hopeful of "a reset of relations" long strained over the war in Afghanistan. Foreign remittances sent by overseas Pakistanis have increased by 13 per cent, 5.4 billion US dollars, in the first quarter of the 2018-2019 fiscal year (July 1-June 30), in comparison to the previous year, according to figures released by the State Bank of Pakistan (SBP) on Thursday. The SBP reported that overseas Pakistani workers remitted 5.419 billion dollars during the period from July 2017 to September 2018, up 629 million dollars. Inflows from Saudi Arabia were the largest source of remittances. They amounted to 1.263 billion dollars in the first three months of the current fiscal year, up 2.9 percent as compared to 1.228 billion dollars in the corresponding period of last fiscal year. The highest rise in remittances was seen from Britain, which climbed 32.3 percent to 828.4 million dollars against 626 million dollars in the same period of last fiscal year. During the period under review, inflows from the United States rose to 759.4 million dollars, depicting an increase of 18 percent. Among the three major corridors of home remittances, Saudi Arabia is still the largest contributor to remittances inflows into Pakistan, despite lower growth compared to Britain and the United States. Local economists believed that the rise in remittances in the first three months of current fiscal year is a positive sign for the incumbent government as it can play a key role in reducing the country's current account deficit.